This page is intended for practicing clinicians and therapists. It shows examples of disorders, common symptoms and activities that may assist your practice and reduce patient symptoms. HappyNeuron Pro can assist patients presenting with a variety of symptoms through structured activities centered around cognitive remediation. As with all similar tools, these activities are most useful when paired with guidance and therapy from a trained practitioner. When properly applied along with therapy, these activities work to help patients and clinicians develop and test strategies to manage symptoms and improve the patient’s performance in daily life. Beyond the simple day to day application, HappyNeuron Pro is a reliable follow up tool for healthcare professionals thanks to its advanced results unit. This allows users to track progression over time and to adjust the difficulty level of activities, matching ability and treatment progression. The ability to adjust difficulty is a major feature, not only because increasing difficulty is necessary to challenge the patient and highlight improvements, but also because it is important not to lead the patient to a demotivating failure. Therapists can also use the results unit to detect positive or negative changes in patients; for example by measuring an improvement in reaction time or fall in performance. Cognitive Remediation is a cerebral training method based on therapeutic support with a specific cognitive training adapted to patient’s disorder. In the case of psychiatric patients, cognitive remediation is an efficient way to reduce cognitive and psychotic symptoms and help them to improve their daily life activities and social interactions. It helps them to focus on their goals, such as coming back to a normal professional activity. An example of a disorder with the potential for symptom alleviation or mitigation through cognitive remediation is ADHD. Structured attentional function (sustained, selective and divided attention) remediation is an interesting alternative to drug treatments for ADHD. During cognitive remediation therapy, patients will progressively become aware of their difficulties. This new increased awareness will help them to establish, with their therapist, cognitive strategies to accomplish daily life activities by staying focused or by focusing on a prominent element of the environment. Gulf stream requires a high level of selective, sustained attention and working memory. This activity solicits the central executive control of working memory and the spatial sketchpad to memorize the fish during the activity. 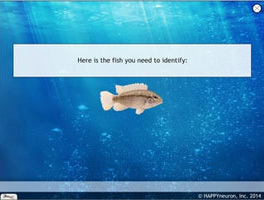 A high level of sustained attention is needed to complete the activity because the therapist can decide to present a few or a lot of fish to the patient. To identify the right fish, the patient must focus on details, exercising the capacity for selective attention. Clinical evaluation shows evidence of negative symptoms (emotional difficulties, inability to initiate conversation) that lead to poor social activities and high dependence. Low cognitive flexibility and planning, selective attention difficulties and visuospatial memory and attention issues multiply those difficulties. Positive symptoms of schizophrenia include disorganized speech and delusional behavior. Improving the performance of executive functions like organization, planning, action inhibition and reasoning can reduce these positive symptoms, allowing increased social interaction and improvement in daily life. 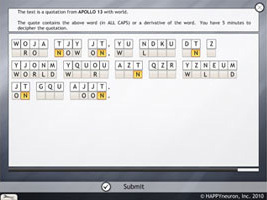 The HappyNeuron Pro activity ‘Decipher’ is built to improve executive functions by engaging patients with training for reasoning by setting up new strategies to decipher text with the help of clues. 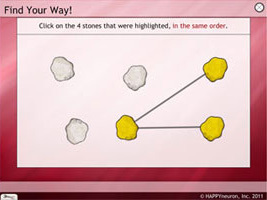 To perform this activity, a patient must use logic and reasoning, creating and shifting strategies to reach the goal. To preview these cognitive remediation activities and more, click here and fill out the form for a free trial. Cognitive rehabilitation is a specific term frequently used for cognitive training after stroke, TBI or neurologic affection. The goal here is to restore cognitive functions, create compensatory strategies and improve the patient’s life conditions. This vision centers on the handicap, but not on cognitive deficits. Just like cognitive remediation, the idea here is to help patients to focus on their life project and avoid environmental situations that create handicaps. The left side of the brain controls language abilities in 88% of right-handed people and in 78% of left-handed people. This means that a major part of left side stroke cases affect language and memory as well as attentional control, executive functions and visual abilities such as facial recognition (depending on the spot of the stroke.) Aphasia is a natural consequence of left side stroke and is associated with a partial or total loss of writing, oral production and/or comprehension. Speech therapists are essential to allow those patients to come back to the typical level of communication necessary for everyday social interaction. 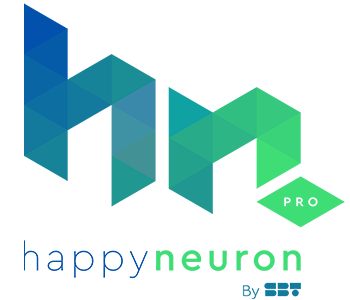 HappyNeuron Pro can assist therapists using cognitive rehabilitation tools and activities to train and evaluate progress. 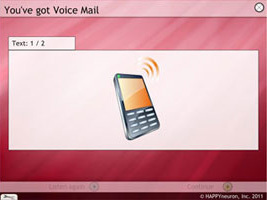 An activity such as ‘You’ve got voicemail’ is perfect for training oral comprehension abilities with simple or complex messages. To answer questions related to the message, patients must understand oral information and memorize it with the help of their working memory. They also need to understand questions and related answers to give the right one. To see how HappyNeuron Pro’s Cognitive Rehabilitation activities can help with your practice, click here and fill out the form for a free trial. Cognitive stimulation is a general term that refers to an ensemble of cognitive training methods. Contrary to cognitive remediation or cognitive rehabilitation, cognitive stimulation does not systematically include a patient with cognitive deficits or include a therapist. Normal people can use a cognitive training program to prevent, for example, memory loss. Cognitive stimulation is also used to slow the cognitive effects of neurodegenerative pathologies such as Alzheimer disease. Memory is one of the most affected cognitive functions in the most common types of progressive dementia: Alzheimer’s disease and Lewy body dementia. Those pathologies damage brain structures that host memory such as the hippocampus, entorhinal cortex or frontal cortex. Hence, working memory and declarative memory rapidly deteriorate. Memory improvement in patients with dementia can stimulate neuroplasticity (neurogenesis, neuronal pathway change, synapses creation) and help to prevent memory loss. During this activity, the patient must memorize a path and reproduce it forward or backward with or without help and with few or a lot of items. In daily life, we often use this ability when we want to remember the path we used the last time we went to visit someone. Spatial working memory activities such as this one can help patients with dementia that are frequently disoriented or that have difficulties remembering an object’s position in a room. For a preview of this activity and others and to test how they can be used with your own practice, please click here and fill out the following form to start a free trial.